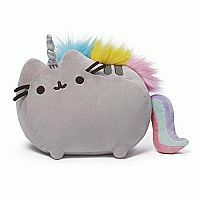 Pusheen just got magical with Pusheenicorn. Pusheenicorn is snuggly soft with a colorful mane and tail. And of course, has a sparkly unicorn horn. Measures approximately: 13.00 x 9.00 x 4.00 inches..